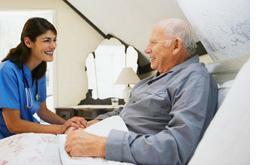 Home care is more than health, it’s comfort and stability. With a Nexim home health care worker, you’ll always know who’s coming to the door. From the moment a caregiver is placed with you, Nexim fosters a relationship that will help you feel comfortable. We recognize that familiar faces aren’t just about comfort. Having to explain your needs to a new caregiver is time consuming, which interrupts your routine and costs you money! Nexim healthcare workers take a contract for the full duration, not just a day at a time. That gives your caregiver time to learn about you and anticipate your needs. If a replacement is required, we keep very good records to ensure that any transitional period occurs quickly and smoothly. You should never feel like you don’t have control over your own space, we take a number of steps to ensure that our partnership is hassle free. Worker – contract fidelity: If Nexim sends you one or more caregivers, those caregivers will remain with you until the end of the contract. We will not send new people to your home without consulting you first. Frequent communication: If a situation occurs that requires us to cover a shift with a caregiver you do not know, you will be informed before their shift begins. Orientation: Before a placement is confirmed, Nexim provides you with a four hour orientation shift. You may be eligible to receive a free orientation. Please contact us for details. Nexim employs a wide variety of caregivers with different skillsets. Our priority is to send you someone who is experienced in exactly the right ways to benefit you. As well as employing Personal Support Workers, we provide training that allow our employees to legally administer medication and deal with crises safely. You can find out more about how we train our caregivers on the career development page. Then just let us know what extra skills you’re looking for! We also have a guarantee that ensures workers we send you will have all the appropriate certifications, such as first aid. With a one hour turnaround, we can also provide you with caregivers at short notice to cover unexpected gaps. Just give us a call, and we’ll find you a healthcare worker in one hour. We take our frequent communication policy to heart. We love to hear from you, and consistently follow up to ask how we’re doing. Your feedback is important to us, we’ll always take the time to listen. If you want to find out more about the specific services we can offer you, please browse on over to the healthcare services page. If you’d like to learn about how our recruitment and placement process works, visit the process page.